Tumble Bees HD has been released. 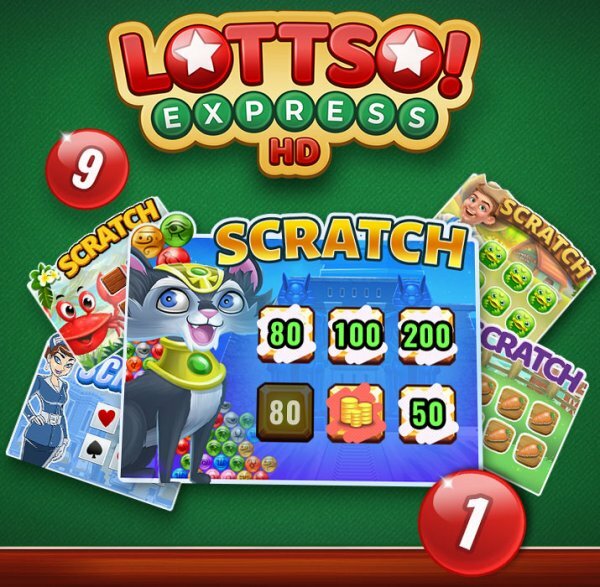 Lottso Express HD will be released on Tuesday 10/23. A marketing image featuring some scratchers is shown above. A new type of seasonal challenge is coming soon. Pogo will call it “Autumn Odyssey”. It will be different from the Magic Marathon, but will also run for one month. Look for this to start at the end of October. Jewel Academy and Jet Set Solitaire have new levels now. Claire Hart Classic has been delayed until December, but Tri-Peaks Solitaire HD is still scheduled for late October. Turbo 21 HD has been fixed so the timer will no longer start before the cards appear. The completion badge for September’s Game of the Month, Crossword Cove, will be sent out this week. Pogo says they will preview the “new awarding system” in December and January. Pogo is calling it a “Challenge-based Reward system”. Java 11 will no longer be supported by Internet Explorer. If you would like to continue to play Java games on Internet Explorer, do not upgrade to Java 11. New Poppit! Party costumes are coming! Look for a sneak peek of those in November. Yikes, so magic marathon and this autumn odyssey one, they’re tryin’ to kill us/keep us mighty busy, etc. lol! There were 4 more M&M Completion Badges added today, increasing the number in circulation to 162. Why why why why why.. do we need another hidden objects game? We have like 10 at this point (probably off a bit but feels like that!). They all play similar so we only need 1-3 with different themes. The new ones are awful too IMO. Lottso Express HD looks better but think we all can agree that they should have just worked harder to get Lottso (original) in HD. Express was always boring alone. I’ll try to explain this. I’ll use Big City Adventures and Undiscovered World as my examples. Both of these HOGs have 12 episode cities/cases. We get 1 free episode for each city/case. A new city/case is released every 3 months. The new HOGs only contain 12 episodes, 1 of which is free. Pogo does not add on to them, they are just standalone themes. Instead of adding another story to the new HOGs they release a new game with a totally different theme. Original Lottso is a multi-player game. They haven’t converted a single multi-player game yet. Still trying to figure out if it’s because they can’t make those sort of games in HTML5 or too much work for them to do so. Yeah I know. It’s just frustrating since they might add 12 episodes (and that’s it) but usually 1 (maybe 2? I don’t honestly remember since I never play the games outside of weeklies) are even free. So it’s a cash grab, plain and simple. I just don’t think we need oversaturation of the same kind of games. They all plain pretty similar (even the new ones use the same ol’ powerups.. nothing exciting), just they have different looks. Llama said they haven’t figured out the technology for the multi-players games. I’m sorry, there has to be a programmer out there somewhere that has figured it out. I can’t believe in this day and age that it can’t be done. Like Gamer, I hope it’s not b/c it’s too much work. I’m gettint tired of it all. I mean, waves of badges, magic marathon, automn whatever, holiday who cares and so on,…. badge all lloking alike, same BS just different names. I want to think I’m one of the few that is not fooled by the “free” label. Pogo is not fun anymore, it has become a “job”, is all about chores (badges) with a deadline, not playing at your leisure anymore IF you want the “special reward”. The funny thing is (at least in my case) the more (so called) freebies and the more “Choices” the less free I feel and the less inclined to play and buy extras I feel. Pogo just lost yet one more player. Alreadi thinking how I will spend the money I’m gonna save for not buying few gems or non at all! Challenged based reward system sounds to me like badges and more badges…….win a 100 badges and get a free one…….haha. And bet they will will start with Quinns too. or maybe more completion badges?? I have no idea if I get them or not. I do not know what I get some of these badges for. I thought I was getting them for using seeds in SG but I don’t think so now. Can anyone tell me if we get more badges in Solitaire Gardens other than the ones ever 5 games or so? You get Happiness Badges for spending your seeds. You get a Happiness Badge when you spend a certain amount of seeds. See Badges and Ranks here on BH, listed under Pogo on the tool bar above to see them. I must agree with some of the previous comments regarding HOG games. I myself play the most familiar case/episode to complete a good portion of badges and can’t stand Trails/Grub. I am not one to complain but one thing I tend to check out in any new game is the level of creativity. That said, I am always hungry for badges and love the marathon format. Furthermore, like many who are waiting on the edge of their seats for the new award system all I can say is: “It’ll be interesting and hopefully it will be a worthwhile system. I still think that tokens should have been used to buy gems.